A lot of artists, creative agencies, and freelancers turn to the internet to showcase their creativity through their work or products and services. This is because it is so much easier to put up portfolios online. For the portfolio creators, they just have to fix their website and upload all their works in a visually-appealing way. Of course, they need to do a little marketing online to get more people to see their work. For potential clients, customers, or even just art appreciators, they can just search a few keywords online and they can already reach your site. What’s good about WordPress, though, is that it already has a wide user base so you can already tap into that if you want more people to view your portfolio. Another good reason why you should use WordPress for your portfolio is that there are so many themes that cater to this kind of need, combining all these various features in the form of extensions, plugins, and add-ons as well as a good design to create a powerful, seamless, and beautiful portfolio theme. The following are the best WordPress portfolio themes of 2017 that can be used for any art. Kalium is another one of those themes that has a lot of information that can be accessed just by scrolling down. The theme has standard features, but it is particular in allowing the user to have freedom in customizing the entire theme based on how he or she likes it. It is particularly catered to design and creative professionals such as photographers, creative agencies, architects, and even fashion designers. Going back to customizing the site, Kalium has over 4,000 fonts available and you can even manage the size of it. It is also easy to customize given the visual composer. For those who plan to use the theme to sell, Kalium has a product size guide for every country so you can sell to more people regardless of nationality. Overall, Kalium is a convenient theme that allows you to sell your products, artworks or not, directly from the website. 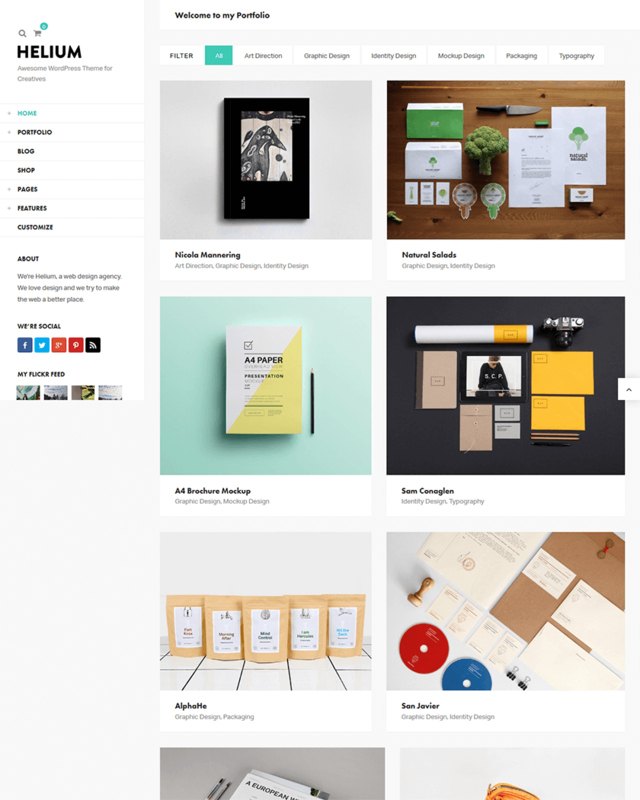 Alpha is a very creative theme fit for creative people including freelancers who are artists and creative agencies. 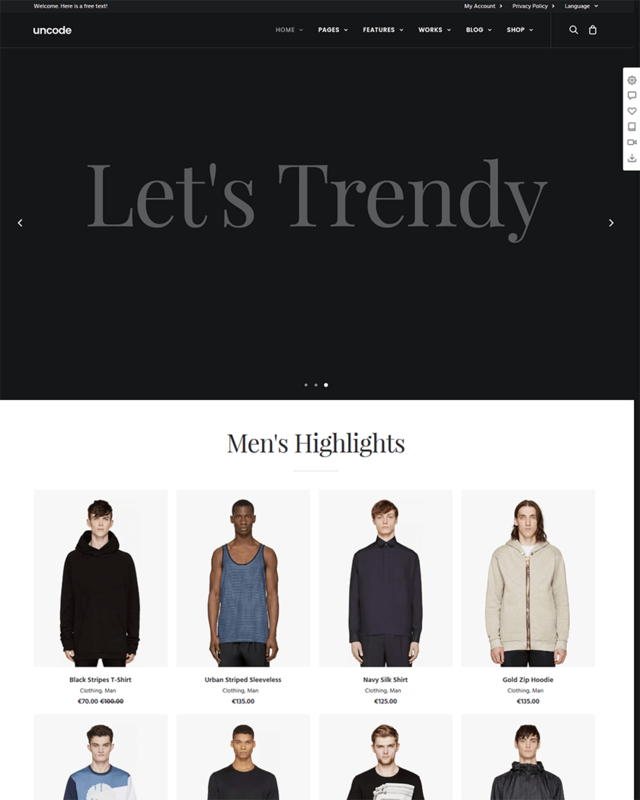 Upon opening the website, visitors are treated with a full-width animated background which also acts as a slider that can be navigated by scrolling. The site does not allow you to scroll down -- navigation goes sideways. Back to the background image, that in itself is already a good opportunity for creatives to showcase their artistic prowess. The theme is not limited to that, though. Each animated background image has a link to another page where you can put your artworks and other important information. For more navigation, the Alpha theme has a menu icon at the top right corner which opens a mega menu. Aside from categories, social media icons are also included in the menu for a more sleek and minimalist integration. Your artworks are definitely the highlight for this theme. 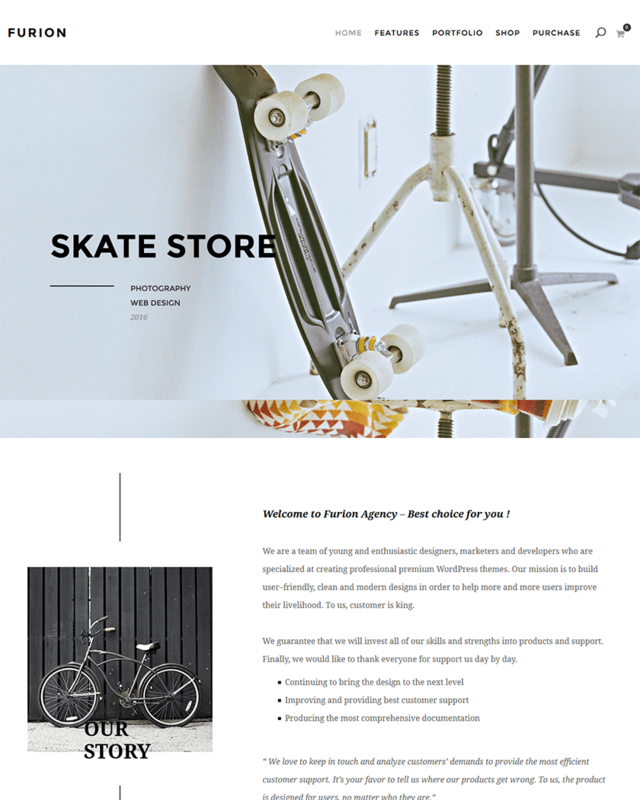 Assemble is a modern, clean, and minimalist theme created to highlight image in the website that can be used for portfolios containing artworks or any creative output created by an artist or even a creative agency. It looks very simple, but each image in the website is designed to be underscored in contrast of the white background of the theme. The theme has 18 homepage layouts, which allows for a creative design depending on the owner of the website. You can choose a layout with a full screen background image, a full screen slider, a layout with an image covering half the screen, or a grid-type layout with different positions. 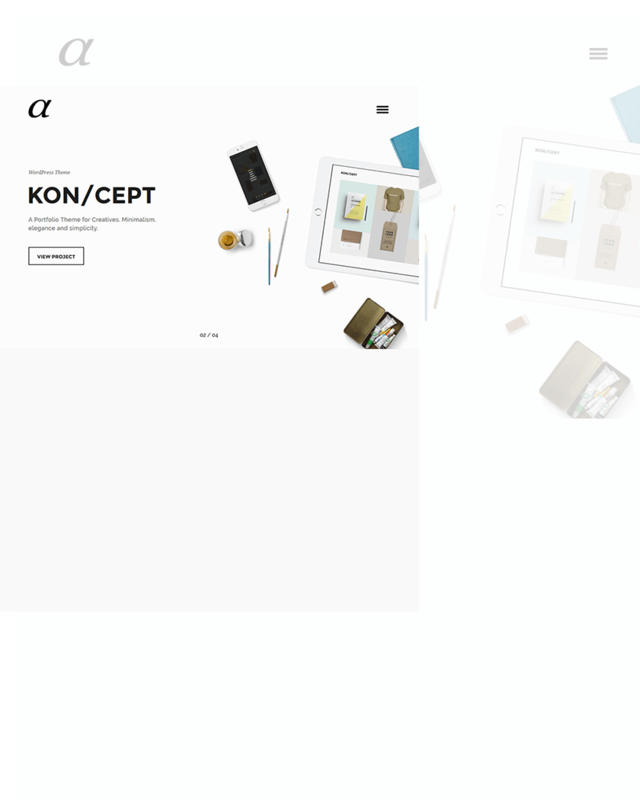 It also has hover effects that are not overbearing and fits the minimalist look of the theme. In addition, it’s WooCommerce compatible, too, so you can sell artworks to visitors directly from your site. Overall, Assemble is a beautiful theme for minimalist-lovers. Grand Portfolio is a modern and well-designed theme that is flexible for any purpose, particularly any creative purpose. For instance, its focus design tool makes it possible to use the theme for photographers, creative agencies, fashion designers, bands, magazines and publishers, and architects or interior designers. Although it is well maximized for commercial purposes as the ones mentioned, Grand Portfolio can also be used for personal blogging. What’s good about this theme is that it gives you a run-down on its different uses, giving you demos so you can imagine it. The features of Grand Portfolio aren’t out of the ordinary, however, they work well with the design and purpose of the theme. It is WooCommerce compatible, so you can sell directly using your website, and it has premium plugins with it: iLightbox and Revolution Slider. It is good to note that the theme has a responsive layout as well. Uncode is a highly multipurpose theme that fits the modern market that is hip yet professional. It is so flexible that Uncode developers let you choose a concept so you can imagine how you want your website to look like while using the theme, and its plethora of concepts is immense. 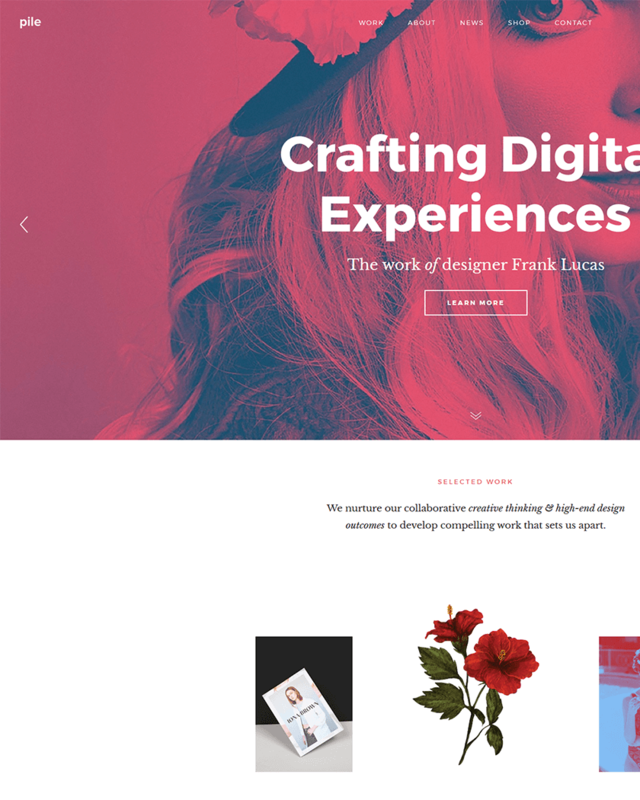 You may use the theme for an online shop, for websites of creative agencies, portfolios of artists, and many others, and each of these uses has different layouts you can discover. Uncode’s features are technically very standard as these are also present in most Portfolio themes out there. It has a web builder, various menu styles, and other features. It’s good to note, though, that it adapts to the image you upload, so you are sure that the quality of your artworks will remain as is. Overall, the selling point of Uncode is really a beautiful and adaptable design. Sydney is a very flexible and multipurpose theme. It can also be used for portfolios if you do can’t spend so much on your website since you can download it for free. 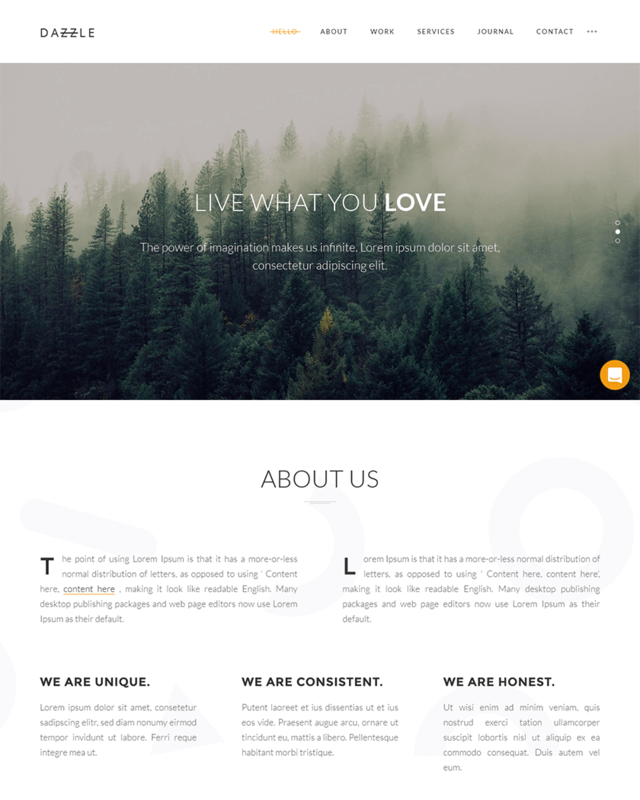 For a free theme, the design is impressive as the typography is eye-catching. It has parallax backgrounds, theme options, a live customizer, fast support, cross browser support, and a responsive layout, and you can all get this for free. Features are fairly common for Sydney, but if you really like its design for your portfolio, but you want more features, you can get the paid version. The paid version gives you a crelly slider, extra page templates, extra widgets, more options in the customizer, WooCommerce compatibility, and a video header, should you need that, on top of the standard features of the free version. 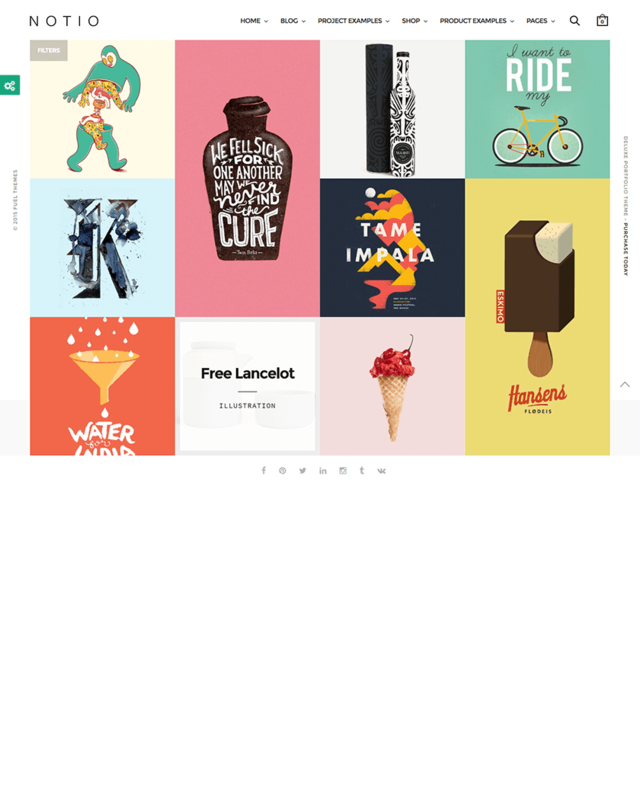 Free or not, Sydney’s design is beautifully made and good for showcase of portfolios. It is obvious that ePix is designed for photographers who need to create an online portfolio to showcase their works. It makes sure that the quality of photos uploaded remains as it is, which is an important feature for photographers since many sites nowadays, to conserve bandwidth, need to resize photos uploaded. This compromises the quality of the photos, and thus destroying the photographs. Although initially designed for photographers, ePix can be flexible, too. Photos of artworks can be uploaded as well. Just like any other portfolio theme out there, ePix gives users creative freedom to design the layout of their website through the various layout options of ePix. In addition, there are necessary plugins you can enjoy with ePix so make your portfolio have that extra creative kick. The theme gives you good features and the design is fairly nice as well, so this could definitely be a good deal. Helium is a WordPress theme good for portfolios that has a unique layout. Unlike most layouts that has an entire homepage that is scrollable, Helium has a frozen sidebar where all links are found. The entire space on the right is the scrollable part. It is obvious that Helium is designed specifically for portfolios as it is designed to enumerate creatively the different galleries/portfolios of the artist, and artists can upload many galleries. Just like many WordPress themes, Helium can be customized with many options to play with using a live customizer. Other features are standard, such as having a responsive layout, SEO optimization, and many others. Customers of Helium noted two important highlights of Helium: the reliable customer support and the features packed in. Overall, for a unique and straightforward website, Helium is a good contender as a theme for portfolio creation, and many customers are satisfied with downloading it. The Craft Portfolio theme is designed primarily for architecture and interior design work as how it is marketed. It has various homepage layouts that could admittedly be good for showing buildings, infrastructure, and home design photos. It also has portfolio pages for sets of photos and works. But because of this, it seems that Craft Portfolio can also be good for other types of artworks such as photography. Craft Portfolio has good features, too. Its customer support is marketed as high quality. The theme also ensures that uploaded photos are of good quality. For texts and other information, Craft Portfolio has inner pages for this specific purpose. The theme uses good typography all throughout the website, too, making the site visually stunning, modern, clean, and very professional. 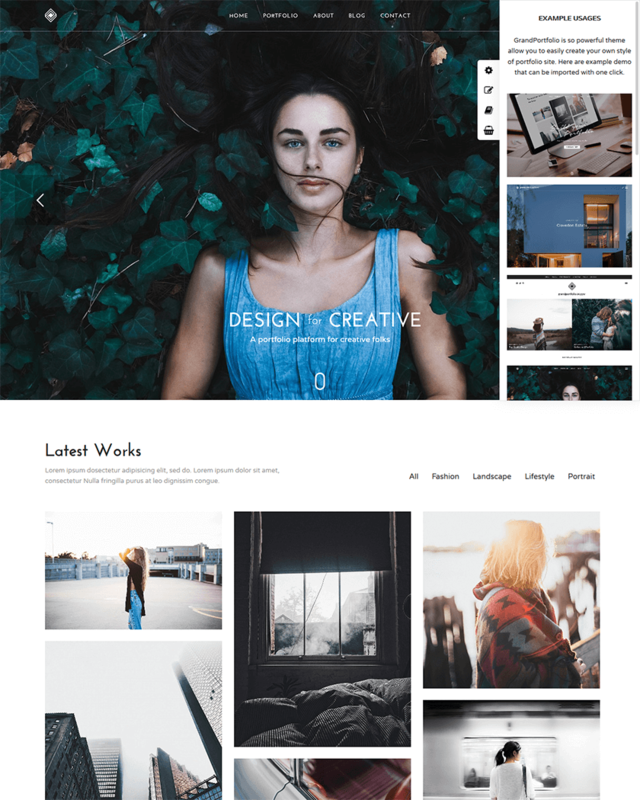 Overall, Craft Portfolio is one of the best portfolio WordPress themes out there, and it even has integration with social media platforms. Minimalism is one of the fast-growing trends nowadays for artists in terms of portfolio creation. This makes sense as artists would like their work to be the highlight of their websites, and it also gives a good website experience for visitors. Proton is one of those minimalist themes that look steely and direct to the point. It allows users to create various sets of portfolios in one website, and because the theme is simple and minimalist, it is good for any kind of portfolio. The simplicity of the theme translates to its speed as it has a fast loading time and navigation is fairly easy. It has many portfolio styles as well, for a more creative touch for different artists. It also allows artists to sell their artworks directly through the WooCommerce plugin integrated seamlessly within the theme. For minimalist’s lovers, Proton is another option as it seems very functional as well. Avoc is a theme you might have difficulty pinning down in terms of the design. It is very flexible, although it is created primarily for creatives who need to show off their work on the website particularly freelancers, artists, and even creative agencies. Avoc has many demos to choose from to show off its flexibility, showing different kinds of layouts you can choose from depending on the purpose of your website. Each layout looks different than the other, allowing for a unique website through Avoc. Features are relatively standard for Avoc. Its design is also responsive and retina-ready. It has uses parallax effects for a good website experience and bears nice pagination. You also have full control with the typography so there is a lot of room for designing your own website with this theme. Overall, Avoc’s flexibility can be very liberating for artists who are dying to show their own style. Draft Portfolio is one of those visually appealing themes that really try to catch you with its design. It uses big and bold typography that welcomes the visitor into the site. As such, it allows for a concise and direct to the point interaction on the site. There are no frills with Draft Portfolio, making it arguably minimalist, and it ensures that the artworks you upload online will be the highlight of your website. Its features depend on which version you purchase, either the free version or the paid one. 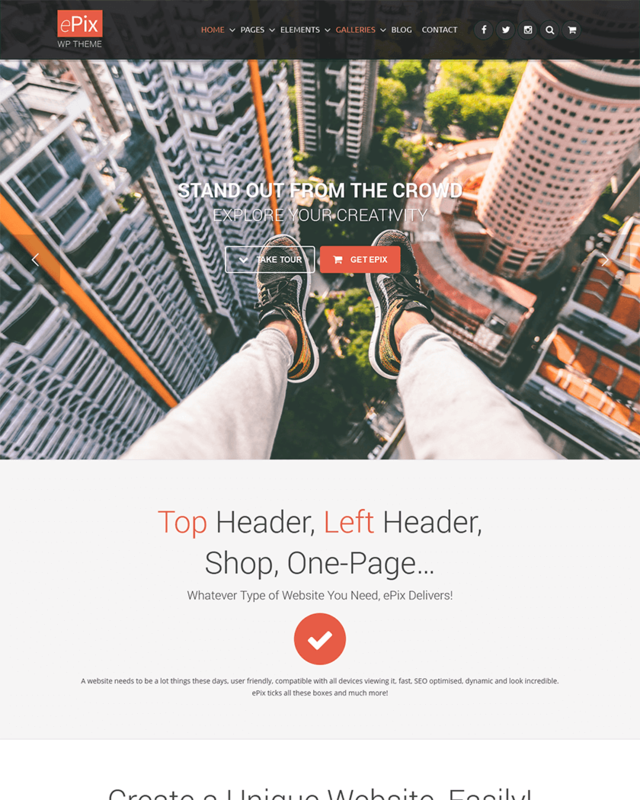 The paid one allows you to fully personalize your theme for a more creative approach. Apart from that, support from developers can be expected with the paid version. Both free and paid versions are responsive and have various options for menu and customization. Overall, Draft Portfolio looks very common in the sense that a lot of themes almost look this way. Furion seems like the type of theme that looks like a template theme as it employs very common features in terms of design, but it has quirks and other features that make it a notch different than the rest of themes who look like Furion. The design is minimalist, but the positioning and transition are different, yet very easy to navigate. This is good or creative agencies and professional artists at work. The layout employs a masonry puzzle and grid portfolio layout with a lot of custom options. It even has hover effects for extra artistic touches, making the theme more visually amusing. Apart from this, it basically has standard features like advanced customization, a responsive layout, a support center for problems, and SEO optimization. Overall, Furion seems to be a fun and quirky theme for portfolios yet it still looks professionally made. It is also a very functional theme. 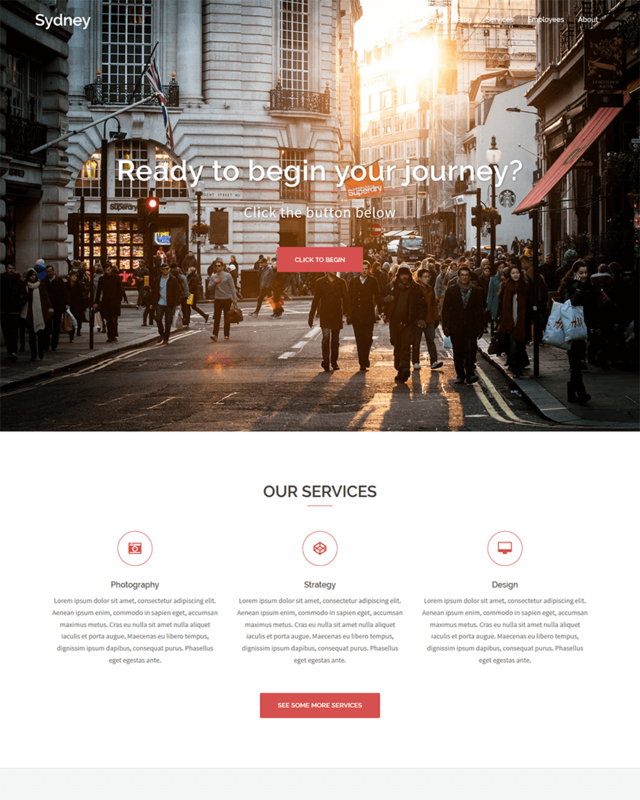 Oshine is a highly flexible and multipurpose theme in that it actually looks different every time it is applied to a website. Looking at the demos, it seems that Oshine allows for a very liberating customization because traces of the theme can’t always be found. This makes Oshine applicable to any type of use, but it is fully maximized if used by creative agencies or freelance artists who want to show off their work. Oshine allows for unlimited portfolios, so you do not have to keep putting down past works just to make up some space. It has a page builder, unique layouts, premium slider plugins, is WooCommerce compatible, and many other features, which explains its flexible nature. Many customers of Oshine take note of how the theme is easy to use, which is one less headache for artists who want an online presence without having to go through technical coding. Milano is another minimalist theme, but it does not look like all the other minimalist themes precisely because its typography is very different compared to all those that use big block letters and sans serif fonts. Of course, Milano still use big letters, but it does not seem as obtrusive as other designs of portfolio themes out there. This is fully customizable, too, so in any case, you can choose how you want your texts to appear on your website. 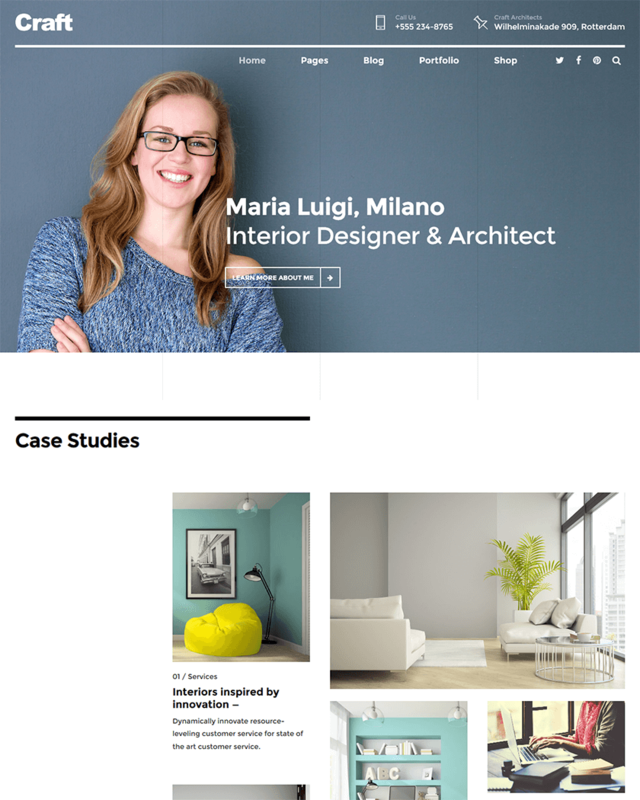 Milano has several options for hero images whether you want it to be in a light color, dark color, or in a slider. The slider in itself has several effects, too, such as the blur effect, book effect, the basic linear, bubbles, cube, and many others. The menus also have various options as well as how you want your portfolio to look like. It’s a very versatile theme for portfolios. 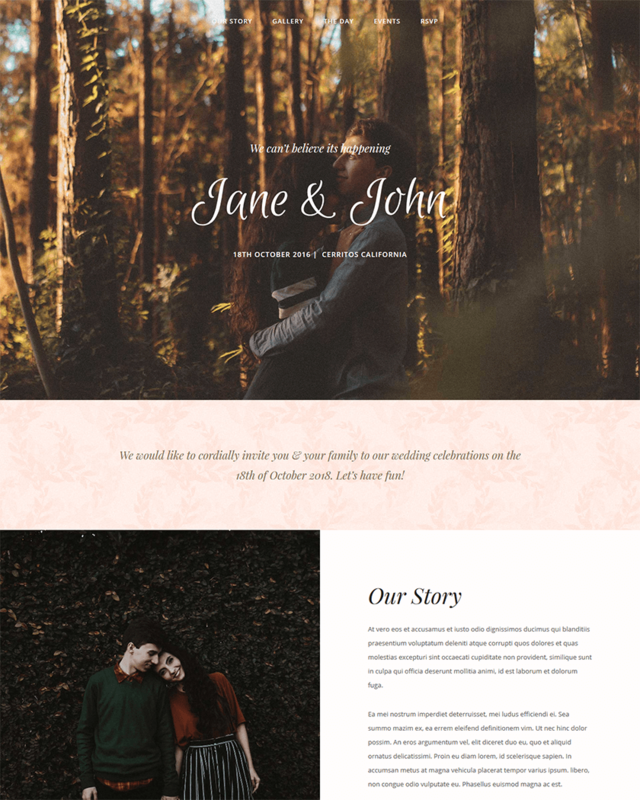 Jevelin is actually a multipurpose theme, so it is not exactly created just for the portfolio creation purposes. 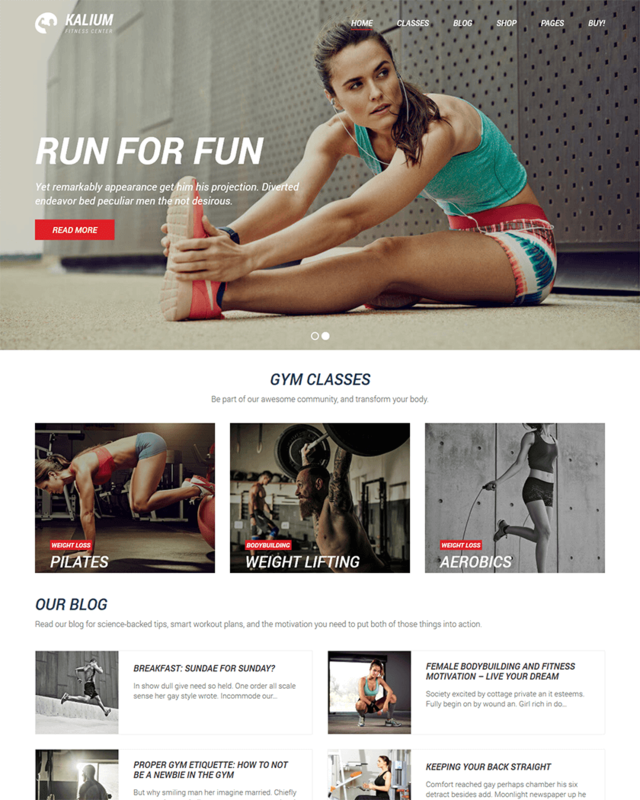 It can be for fitness-related websites, corporate websites, and creative agencies. The design is very simple yet it is clean, sleek, and crisp. As such, it also seems like a good website for portfolio creation. There are many demos to choose from to get an idea of how you can use Jevelin. 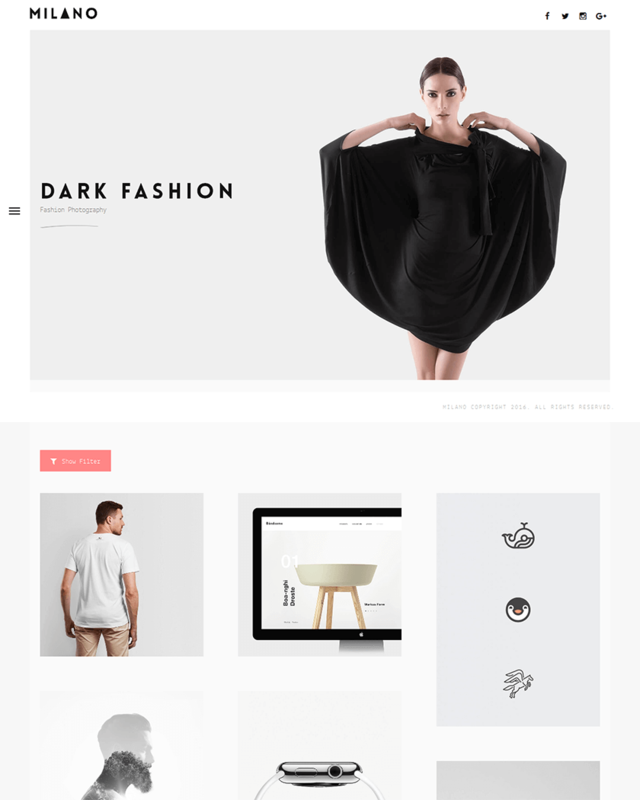 As for the features of the theme, Jevelin has a slider revolution, is WooCommerce compatible, is responsive, has a Contact Form 7 for inquiries, is easy to install with just one click, and is SEO optimized. 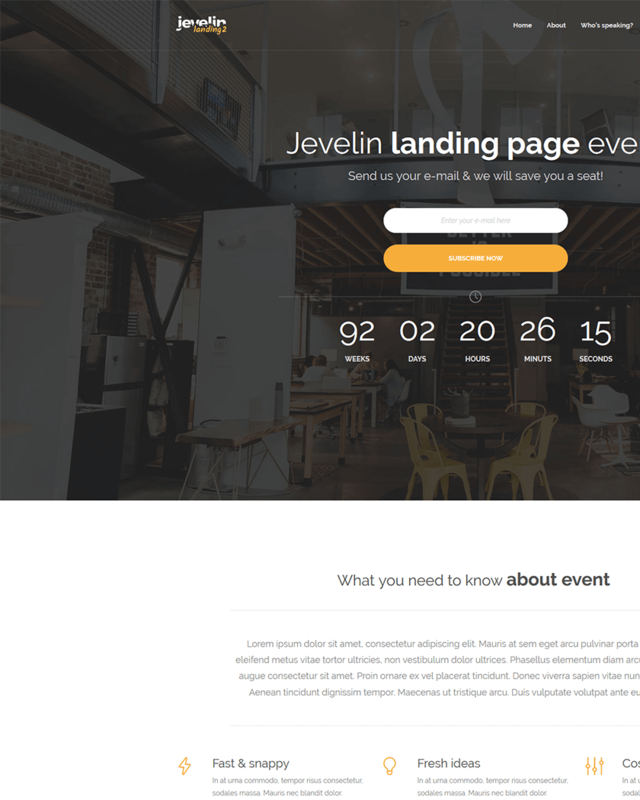 Jevelin is very customizable, so you can be sure that your website will look different from the other websites that use Jevelin as a theme. Overall, Jevelin is a good theme for various uses, even for portfolios as its features allow for creative freedom. 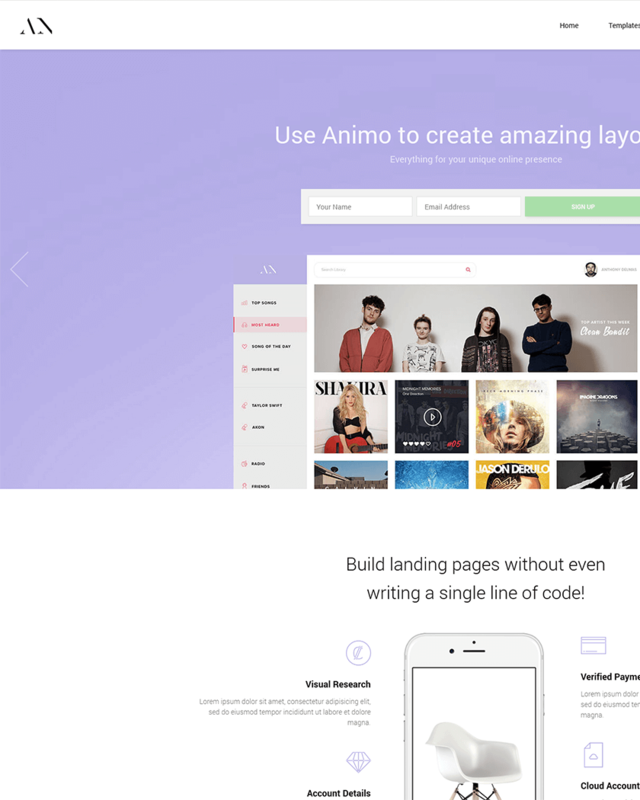 Animo is a very beautifully designed theme that is also fully functional and powerful. In fact, it has won 10 awards precisely for this. It gained enough traction to be awarded for AWWWARDS, CSSLight, Boostlizer, cssmania, WebGuru Awards, CSS Nectar, FD, CSSReel, BestCSS, and HTMLS Mania. It is multipurpose, too, but it looks perfect for portfolio creation for artists who need to have a visually appealing website. Animo has over 30 templates to choose from, ranging from creative ones to very business and corporate ones. It also allows you to create your own template if you do not find the preset ones satisfactory. Apart from standard features, it also has some minor features that are good to have such as an Isotope plugin, pricing table layouts, and shop pages for E-commerce. It is no wonder that Animo has been awarded several recognitions as it is not just beautiful but powerful. A modern and elegant theme, Dazzle can definitely dazzle and visitor of your portfolio website. It is sleek and clean, almost very minimalist but still has style that exudes professionalism and creativity, which artists need to show to their potential clients. This can be used by creative agencies or other artists such as photographers as the theme really make for a visually stunning experience. Dazzle has many homepage layouts to choose from, ranging from hero images to straight on portfolio layouts. The demos are there to guide you, should you want to see how your website will look like with Dazzle. It also has unique headers -- apart from the ones seen at the very top, you can have a full screen menu or a left side header. It also has inner pages should you wish to put a lot of information on your site, but not make your site look messy. For artists who are bold, Pile is the best portfolio theme as it can match however bold you are. It does not try to be minimalist, but its layout is clean. It has striking colors for artists who are creative in that aspect, so Pile will definitely translate your style to the website. 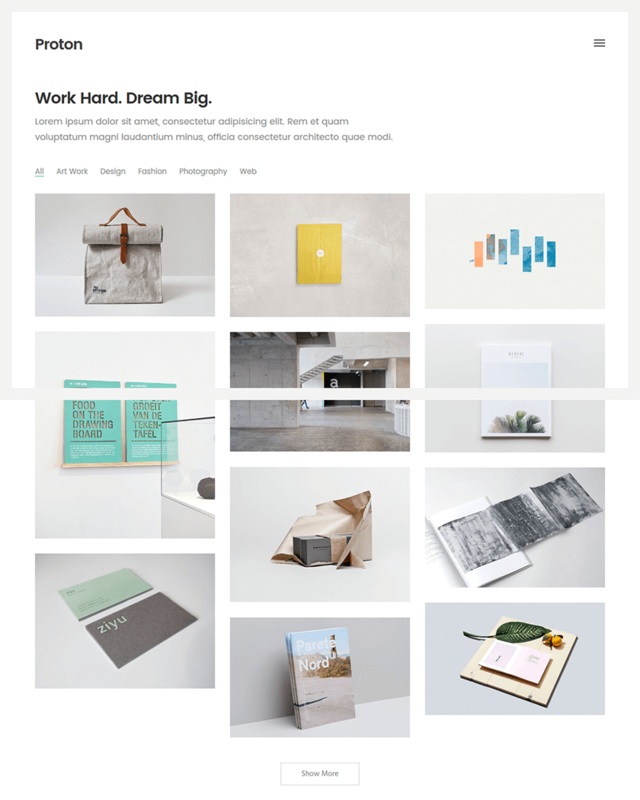 It seems like a breath of fresh air to see a theme such as Pile among all the other very minimalist portfolio themes. What’s good about this is that Pile is not overbearing in its design. Pile is fully customizable, and it is pretty easy to customize too through the use of its smart layout builder. It also allows you to put up an online store so artists can sell their works directly. Pile may be a tad bit pricey at $225, but it seems that it really offers a different website experience both for you and your customers. 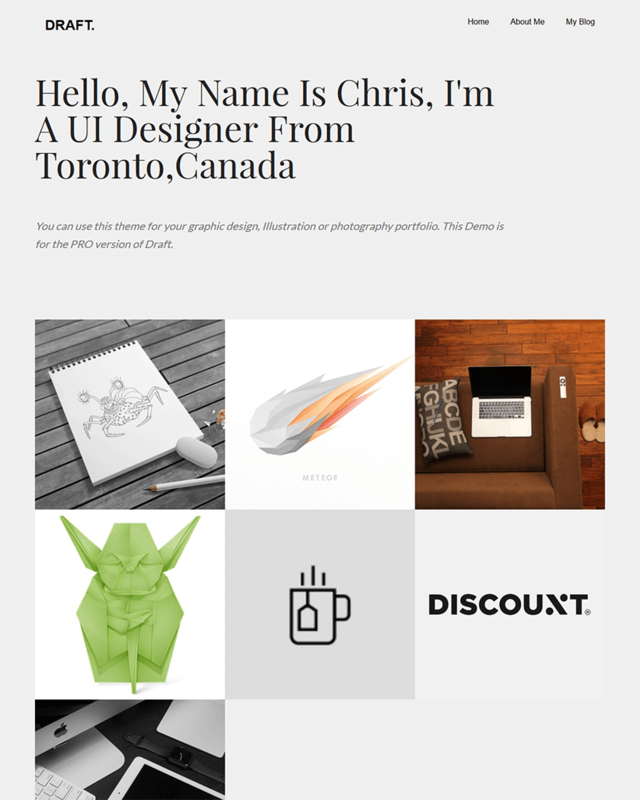 Another minimalist contender is Notio, which seems to be created for artists who need to showcase their portfolio online. Upon opening the demo, portfolio is the one who will ultimately welcome you, and it creates a beautiful grid of all your portfolios. The header is just a small bar at the very top containing links and your website name. Of course, this is fully customizable. There are actually 10 portfolio layouts you can choose from, each highlighting your own portfolio differently. You can maximize this to show your own artwork. 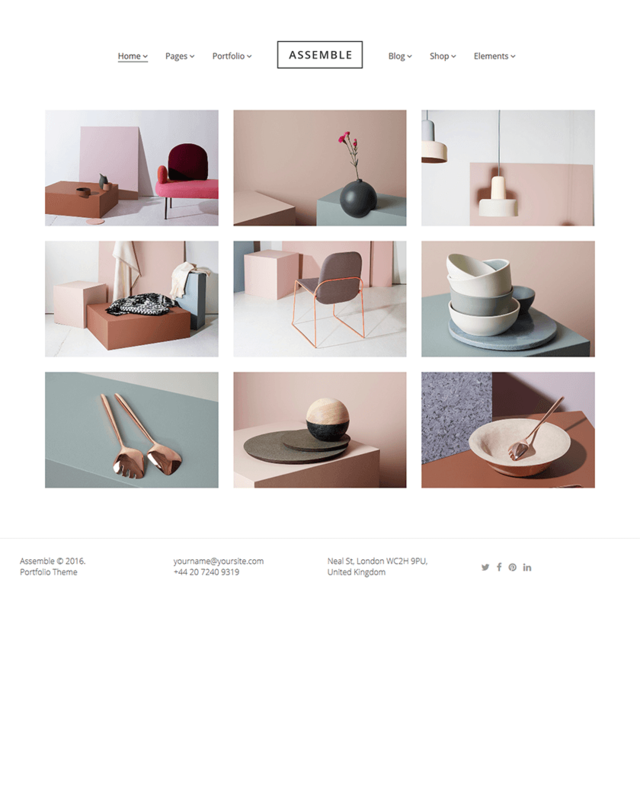 There are also eight portfolio detail pages for you so each portfolio is created beautifully. In addition, it is also WooCommerce compatible, so you can sell your artworks through your site. Overall, Notio is a good option for you online portfolio as it has eye-catching layouts for your portfolio so you are sure that your artworks are the main highlights of your website. Maav is beautiful and clean. It employs a sleek, minimalist layout, but because of how it looks like, it does not really give any real advantage in terms of design as there are so many minimalist themes out there for portfolios. It does have parallax effects, too, for an added creative touch, but overall, in terms of design, it looks very common. However, it still looks quite stunning in how it uses its minimalistic features. Maav is limited in terms of features, for a theme that targets artists who need to put up their portfolios online. It only has two portfolio layouts and limited homepage layouts. It is easy to install, though, with a one click setup. It also has a page builder to give your site an expression of yourself and your work. 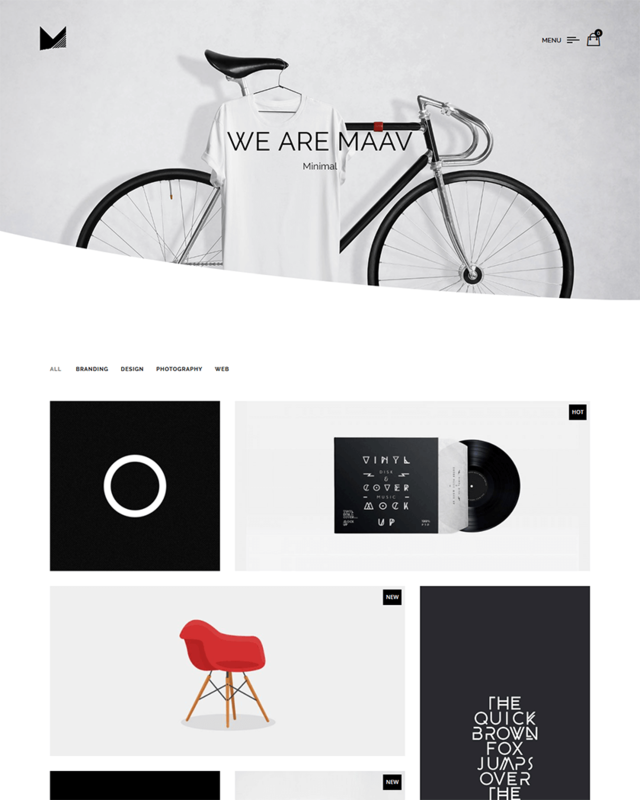 Other than that, Maav is a common, yet beautiful theme for portfolio websites. It’s nothing too fancy. Another minimal theme is Nakamura. It is very minimal that, upon opening the website, you only see the website title, a few categories, and the portfolio already welcomes you. 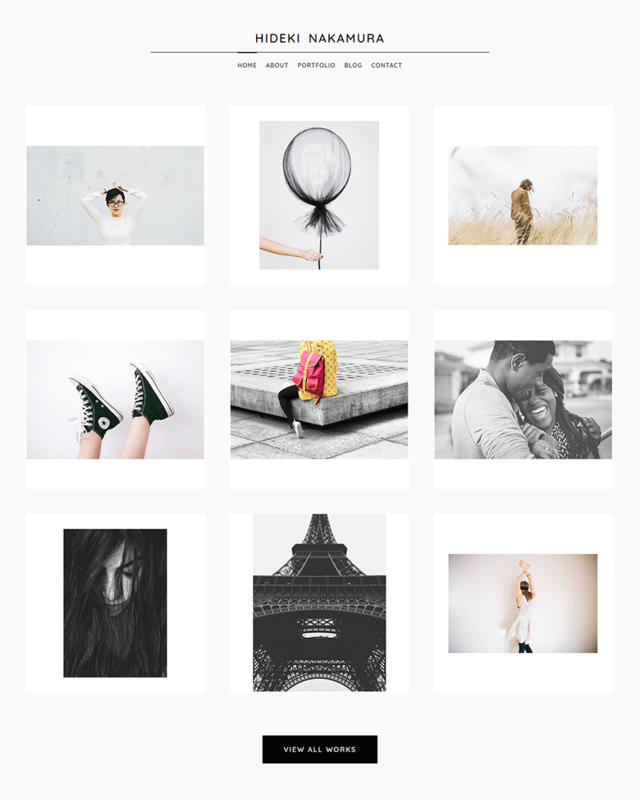 Instead of the usual white background, Nakamura uses a gray background, but the portfolio grid images are bordered in white, making them look like a grid of polaroid images. This seems like a very cute and clean design. Nakamura is not exactly features-packed, but that is what makes it lightweight. It allows image or video formats, has a Contact Form 7 that you can enable, has social media icons set at the footer, is translation-ready, and other things. For a very simple design, without all the frills, Nakamura is the epitome of minimalistic, even in its features. If that’s what you’re after for your portfolio, then you can give this a go. It doesn’t look like pretentious in its minimalism.